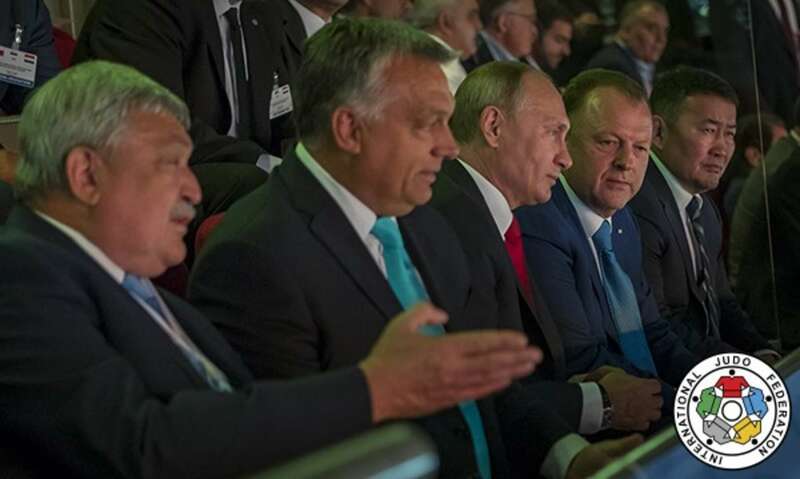 The 2017 Suzuki World Judo Championships attracted world leaders on opening day in Budapest as Russian Federation President and IJF Honorary President, His Excellency, Mr. Vladimir PUTIN was among the three heads of state at the László Papp Budapest Sports Arena. H.E Mr. PUTIN was joined by H.E, Mr. BATTULGA Khaltmaa, President of Mongolia and President of the Mongolia Judo Association, and H.E Mr. Viktor ORBAN, Hungarian Prime Minster, as three heads of state followed a riveting first day of judo at the IJF’s premier World Judo Tour event alongside the IJF President Mr. Marius VIZER. 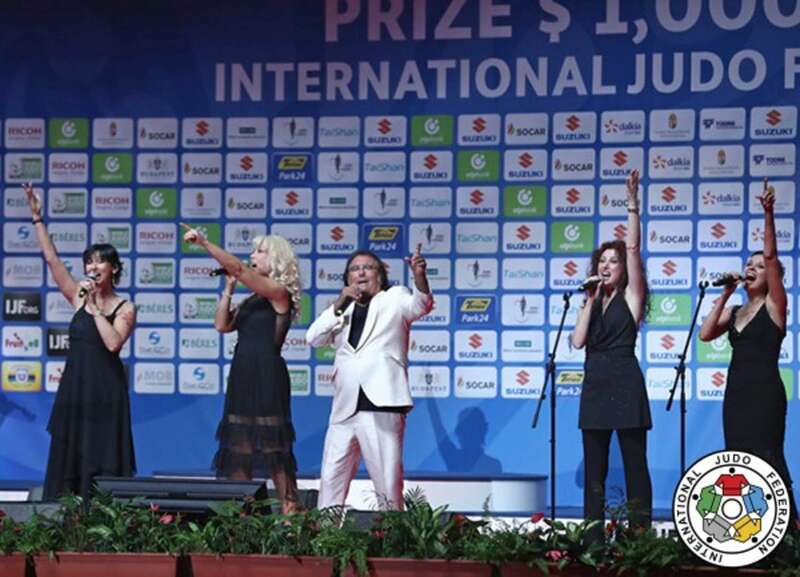 IJF Ambassador Al BANO sang the IJF anthem and entertained the crowd with a few of his most famous hits before a dazzling lights show entitled ‘Game of Light’ and the presentation of the flags of the 126 competing nations. 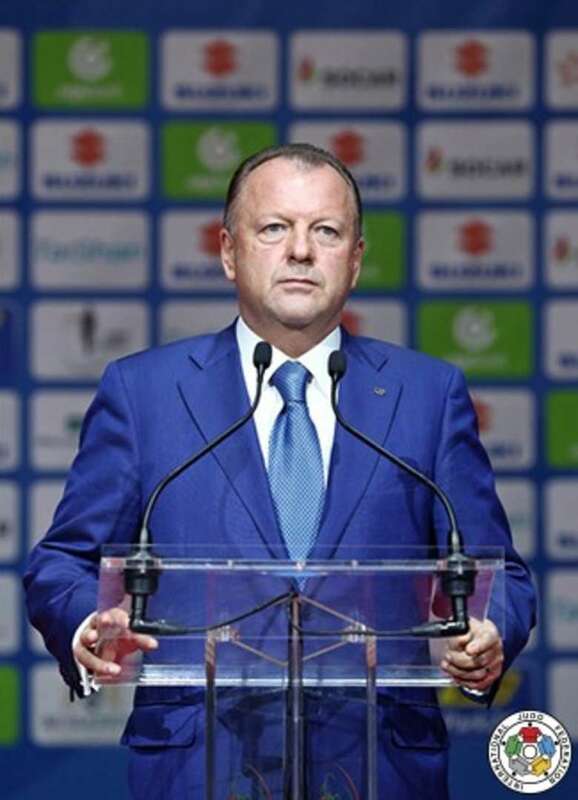 Mr. Marius VIZER, IJF President, said: “Your Excellency Mr. KHALTMAA Battulga, President of Mongolia, Your Excellency Mr. Viktor ORBAN, Hungarian Prime Minster, dear guests, ladies and gentlemen, it is a great honour to have world leader with us today as we open the World Championships. His Excellency Mr. PUTIN, who holds an 8th Dan from the IJF, joined the opening day of the IJF’s seven-day supershow, ahead of the final block. His Excellency Mr. PUTIN has regularly trained with the Russian Olympic team, and last attended the World Judo Championships in 2014 in Chelyabinsk, Russia. The first World Championships of the new Olympic cycle towards Tokyo 2020 started with two gold medals for the sport’s homeland and hosts of the next Olympiad. Two new champions were crowned with the women’s -48kg and men’s -60kg world titles all decided. Before the final block the opening ceremony took place with a special animated show before the world premiere of the new IJF anthem on the World Judo Tour. Mr. Marius VIZER, IJF President, shared his thoughts at the conclusion of day one. The 2017 Suzuki World Judo Championships continues on Tuesday with the men’s -66kg and women’s 52kg categories taking to the tatami. Both Rio 2016 Olympic champions in these weight categories will be in action as Fabio BASILE (ITA) and IJF Best Female Judoka Award winner Majlinda KELMENDI (KOS) will be bidding for world. Dusseldorf Grand Prix winner TONAKI Funa (JPN) was crowned world champion in her first appearance at the IJF’s annual blockbuster as the 22-year-old thwarted the most accomplished judoka in the category to win gold. Former Junior World Championships winner TONAKI, who took silver at here in the Hungarian capital in 2015 at the Budapest Grand Prix, had the measure of former world champion MUNKHBAT Urantsetseg (MGL) in the -48kg final. 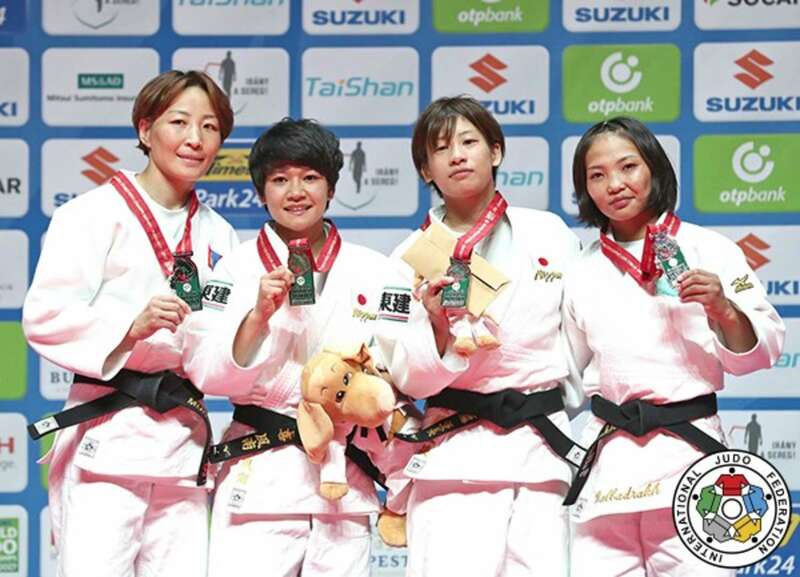 TONAKI followed in the footsteps of her coach and 2009 world champion FUKUMI Tomoko as she literally swept aside her seasoned Mongolian opponent with ashi-waza with 25 seconds left. That waza-ari score was well-timed and well-executed, in typical Japanese fashion, as the relaxed Japanese looked at ease under the bright lights of the World Championships and on the top of the medal podium. In the first semi-final Rio 2016 Olympic bronze medallist Otgontsetseg GALBADRAKH (KAZ) lost out to TONAKI – who had earlier defeated Teikyo University colleague and close friend Stefannie Arissa KOYAMA (BRA) – in golden score. A waza-ari score for TONAKI sent her into the gold medal contest and the Kazakh ace into the bronze medal contest as Asia ran the -48kg category in Budapest. In the second semi-final MUNKHBAT did enough to defeat Rio 2016 Olympic bronze medallist and former world champion KONDO Ami (JPN) who received her third shido in golden score. The Japanese judoka almost opened the scoring in regulation time with a osoto-gari but MUNKHBAT escaped the dangerous situation and forced the contest into golden score. KONDO was penalised after 90 seconds of added time for a gripping infringement as the Mongolian fans waved their flags with a wave of patriotism. In the first bronze medal contest KONDO defeated Baku Grand Slam silver medallist Milica NIKOLIC (SRB) by pinning the Serbian judoka with a kami-shiho-gatame for ippon having led by a waza-ari. KONDO came here to reclaim her world title and will be hugely disappointed with the final outcome today. NIKOLIC meanwhile continues to make ground on the world’s elite and is set to be a major factor in the -48kg picture on the road to Tokyo 2020. In the second bronze medal contest world number one and pocket-rocket GALBADRAKH defeated European Championships silver medallist Irina DOLGOVA (RUS) to win her first World Championships medal. GALBADRAKH represented Mongolia earlier in her career and the Mongolian supporters were right behind their former judoka as she picked up her highly-rated Russian rival with a ura-nage for ippon. GALBADRAKH fought back the tears as she claimed bronze and a Worlds medal to follow her Olympic bronze medal having only switched to Kazakhstan in 2015. Rio 2016 Olympic bronze medallist TAKATO Naohisa (JPN) won World Championships gold for the second time to return to the top of the sport in the -60kg category. Seven-time Grand Slam gold medallist TAKATO, 24, ended his country’s 16-year wait for a world gold medal in the lightest men’s category in 2013 in Rio de Janeiro and was back to his explosive best in Budapest. The Japanese star regained his red backpatch, which is awarded to reigning world champions, with a fourth career win over former World Judo Masters winner Orkhan SAFAROV (AZE) by the maximum score. Tokai University member TAKATO won the gold medal battle between the home of judo and the next hosts of the World Judo Championships as Japan topped Azerbaijan to take full control of the medal table. In the first semi-final Rio 2016 Olympic bronze medallist Diyorbek UROZBOEV (UZB) lost out to SAFAROV by ippon as the Uzbek was in fine form before the medal contests. In the second semi-final Rio 2016 Olympic bronze medallist and former world champion TAKATO Naohisa (JPN) conquered world number 39 Pavel PETRIKOV (CZE) by a waza-ari score after a gutsy effort from the Czech judoka who was a surprise member of the last four line-up. 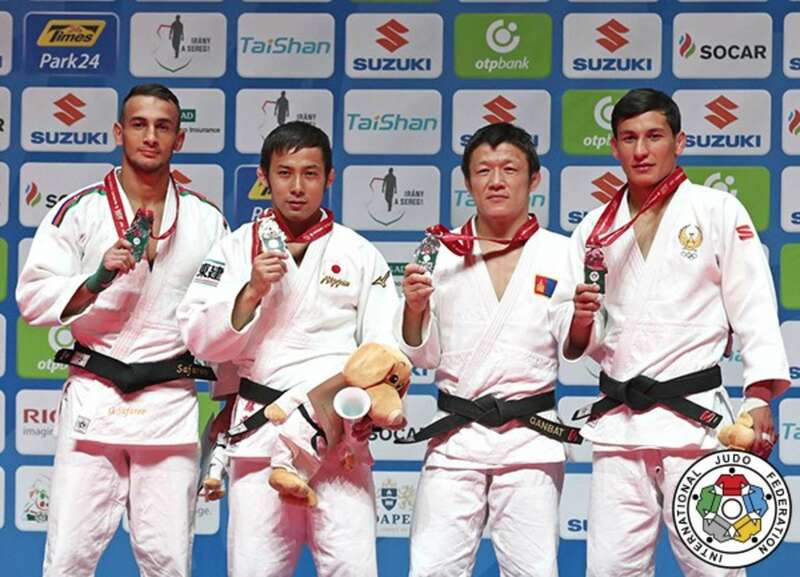 In the first bronze medal contest former Baku Grand Slam bronze medallist PETRIKOV fell to former world champion GANBAT Boldbaatar (MGL) by a waza-ari score after four minutes as his country medalled in both weight categories contested on day one. In the second bronze medal contest UROZBOEV won his first World Championships medal as he won a domestic dispute on the Worlds stage against compatriot and Asian Championships bronze medallist Mukhriddin TILOVOV (UZB). A waza-ari score from the former proved to be the only score of the contest as the 24-year-old continues to prosper with medal-winning displays at the sport’s two leading events in the space of 12 months.